Whether your goal is to simply learn more about what your voice can do, or if you want to become a professional singer, singing lessons are certainly well worth your time! There are so many benefits of singing lessons – try a class today! Students learn memorization and study skills over the course of singing lessons that can easily transfer across to other areas of their life, including dance and academics! These skills include focus, practice, self-discipline and determination. Many studies have shown that music instruction can also help increase brain function! It does so by developing complex and advanced hand-to-eye and hand-to-hand coordination, and also greatly increases the ability to multitask. Many of the worlds greatest minds (including Einstein!) all utilized classical music and instruments (such as voice) to help develop theories and inventions! Singing lessons also help to build your public speaking skills. It will help you in learning how to phrase, project and dictate accurately, which could come in handy for future job interviews and delivering confident presentations in front of strangers, peers, and critics! Singing lessons have been shown to greatly improve a person’s speaking quality, including tone, expression, clarity and diction too! It also can be used to greatly help children with low self-esteem. The ability to perform and sing in front of people can provide a great sense of accomplishment and joy, as well as fantastic performance experience. Singing lessons also offers you a powerful new medium for emotional expression! It gives students a great chance to really connect and understand the emotion behind a song, and can allow them to come away with a really meaningful experience. Music therapy is also used as a medical treatment for improving quality of life for people dealing with stress, anxiety or depression, or even as treatment for a variety of physical or speech disorders. 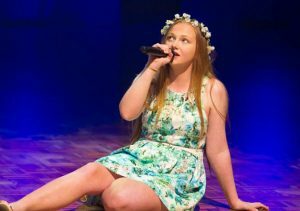 At The WA Performance School we have many different group classes that include singing, such as Singing and Drama, Singing and Vocal Training, Musical Theatre, and our special Advanced Singing Troupe! We can also organise one-on-one private singing lessons to ensure you are reaching your true singing potential!